Since junior high, I’ve been a fee-YOU-jus fan of the rock back Journey. My fellow message boarders know this as my MB name is always Journeyfan, and I frequently annoy them with references to my passion for all things Journey and Steve Perry. 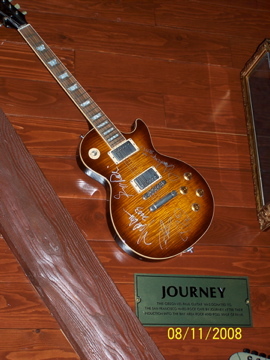 So first, may I just share one little photo from my recent trip to San Francisco…via the Hard Rock Cafe at Pier 39….I give you….a Journey guitar. Is it wrong that I wanted to climb up there and steal that puppy? Guess it was lucky there was a family with children seated below this fine display or who knows what would’ve happened. And as I was just lurking over at 2peas, I came upon this siggie line I just had to show ya…it belongs to Theresa aka Scrap Wench. I don’t know anything about this girl, but I love her! Journey without Steve Perry is like s3x without a p3nis. It can be done, but I don’t recommend it. Okay, I’m done. Back to scrappy stuff. Did ya’ hear about the scrapbook clearance at Target?!?!?! I am also a Pea! =) ….great blog! If I were with you, I would have created a HUGE diversion so you could take that baby!! If I didn’t already love you, I would now!!! My heart skipped a little beat there just seeing that guitar. Journey guitar…..San Francisco…..I can hear him singing Lights right now….yeah….that’s good stuff.